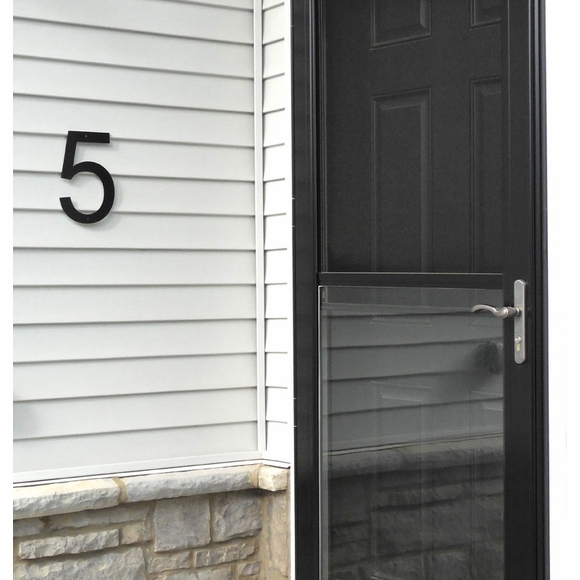 20" Black House Numbers and Letters - - oversized 20" address numbers custom made in the USA. Made from 1/4" acrylic. If you are interested in thicker numbers or letters or in numbers and letters made from metal, please do not order this product. Numbers 0, 1, 2, 3, 4, 5, 6, 7, 8, 9 and letters A-Z. For special characters please contact us using the Request a Custom Quote link at top of this page. Numbers or letters can be arranged vertically or horizontally. Please order the numbers or letters you need one at a time. Single-ply, modified 1/4" thick acrylic construction. Each 20" number comes with four 3/16" diameter fastener holes and mounting screws. Dimensions (approximate): The number 1 is 7.25"W. All other numbers are 12.5"W. Letters vary. All numbers and letters are 20"H.
Made in America by skilled artisans to assure the highest quality.